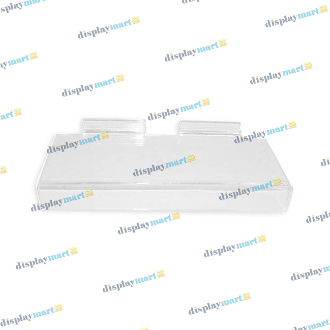 DisplayMart.com has the ideal shoe display for your slat panel! This 4" deep X 10" wide horizontal styrene shelf is sized perfectly for displaying a single shoe, or other smaller sized merchandise. Designed with a 1" high sign holder on the front, this shoe displayer is made to attract customers! Line them together to create a complete shoe section, or spread them apart among other products as accents to your displays. Each shoe shelf has a beautiful crystalline finish to blend in with your pre-existing d?©cor.